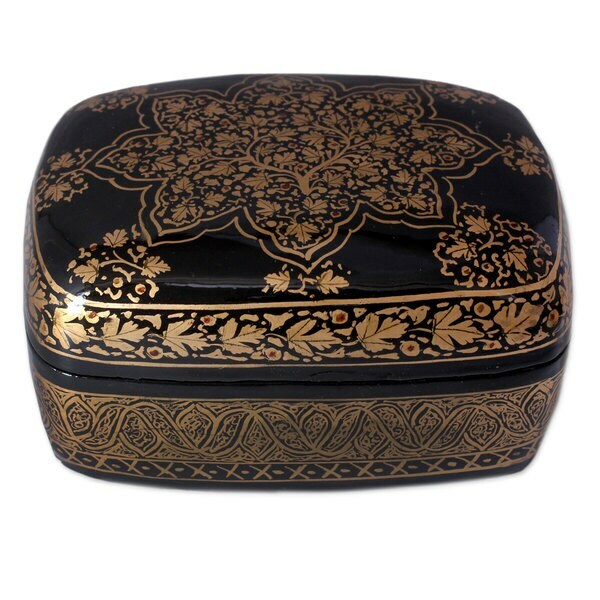 Magnificently handcrafted with paper mache, this decorative box blossoms with golden splendor. Riyas details the florid composition with exquisite artistry as he preserves a beloved artistic tradition. Hi, I'm Riyas and I was born and brought up in Kashmir. As you all know, Kashmir is known for its natural beauty and traditional crafts, so it was indeed fun growing up there. My father was a traditional weaver and I remember he would make exquisite embroidered compositions on shawls. My older brother Iqbal was taught paper mache techniques by a highly skilled craftsman by the name of Gulam, and as I watched him learn, I became interested too. Then I began to learn, and soon after my younger siblings followed suit. Those days were so much fun. On one side my father would be creating his magic on shawls, while us brothers would show our creativity through paper mache. My uncle Niyaz is also a Novica featured artist specializing in paper mache. It is unfortunate that none of us inherited dad's passion for weaving. My father is old now and he does not work anymore, but he is happy that we are enjoying our work. He always says, 'No matter what craft you chose, you should be happy doing it.' When I finished my 12th standard I joined my brother in his work. After making the boxes we would sell them to tourists. Back then, Kashmir used to be flooded with tourists but these days, the situation doesnt allow too many tourists. We also started teaching young boys the art of paper mache. Between 1993-94 we moved to Delhi to explore more opportunities. We started by participating in several government sponsored exhibitions. Customers loved our worked. We are always trying to bring something new to our art. Earlier, paper mache was mostly about scenic and animal themes. However, as per customer demands, we are always doing something new. The Mughal-themed boxes that we do have been widely appreciated. They are our specialty. Iqbal was conferred the National Award in 2004, and I was also honored with two State Awards in 2004 and 2006. It's such a great feeling to be appreciated for your hard work. We were also chosen by the Craft Council of India to participate in an exhibition in Cuba. It was a wonderful experience. Being associated with Novica is a great experience. My craft will be exhibited for the world to see and appreciate.